Do you need to find a resolution for financing your business? A quick sense of panic blows. Whether it’s for a growth opportunity or a short-term cash strain to cover obligations, it’s normal to feel puzzled or anxious as you approach the financing process. Navigating the lending landscape can be daunting. With a basic knowledge — starting with the difference between short-term vs long-term business financing — you can move forward with greater certainty. If you’re a business owner, there are various sources of finance available and each source of investment is useful for different situations. Choosing the right source and mix of funding options is essential for good cash flow, so it’s important to determine your needs and then match a funding option to meet those needs. If you are considering getting a loan or some other sort of investment, an essential concern to keep in mind is not just HOW MUCH you need to obtain or WHY you need to borrow, but also over HOW LONG OF A TIME PERIOD you will require those funds. 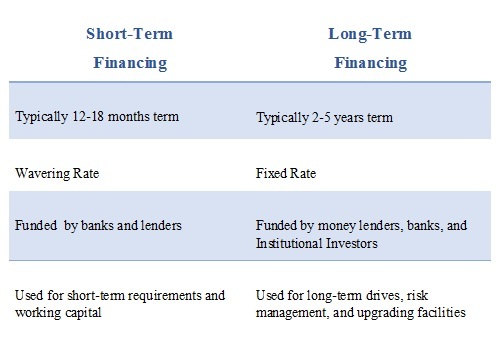 Financing options are further divided into two categories based on time period: short-term and long-term. If you are a small business owner, you have a choice between several kinds of financing, and each one of those has a typical term length (i.e. short-term or long-term) associated with it. Short term financing (working capital financing) relates to the financial needs that arise to finance current assets – for a period of less than one year. It is used in the business’ day-to-day dealing operations. It can help you to pay suppliers, increase inventory and cover charges when you do not have adequate cash on hand. This option is for a smaller amount of funding decision, and you pay the money back more quickly at a higher interest rate, with a shorter approval process. Long-term financing options can help you finance in overall improvements to your business, for a duration of more than 5 years. Capital investments, such as upgrading facilities, buying additional carriers and restoring are financed using long-term sources of finance or long-term loans. Funds raised from long-term financing is more costly because the volatile costs are higher. It also contains definitive provisions which constrain the firm’s scheduled activities. The benefits of long-term and short-term financing can be determined by how they adjust with different needs. Businesses utilise short-term, asset-based financing when they’re first acquiring the ground, and this type of financing is used more for working capital. After a company grows past short-term, asset-based loans, they will typically improve to short-term, cash-flow bank loans. At the point when a company starts to gain rule and sets a track record, they may obtain either cash-flow or long-term loan. Short-term financing is usually arranged with a company’s operational needs. It gives lower abilities, which makes it better-suited for variations in working capital and other continuous operational costs. Generally, short-term financing is granted by banks and lenders and has inflated interest rates. With online funding, such as inventory factoring, businesses don’t have to go through a long application process. The primary criteria are the statement, the customer’s payment history and the company’s prospect outline. 1. Increases Capital – short-term financing provides flexibility and resources to fund capital needs and reduces dependency on a capital source. It enables companies to expand their debt abilities. 2. Matches term of Asset with Span of Responsibilities– The ability associated with short-term financing better coordinates with the average assets purchased. 1. Coincides with Long-Term Strategy – Long-term financing enables a company to align its capital formation with its long-term strategic goals, supporting the business to earn a return on investment. 2. Long-Term Relief – A company can serve from having a long-term association with the same financers. With the right investor, firms gain long-term relationship and connection, in addition to ongoing support. Being that the investment is long term and a company will not have to frequently take in new financing allies who may not know the business as well. 3. Limits Company’s Revelation to Interest Rate Risk – Long-term financing minimises the refinancing risk that appears with other debt, due to its fixed interest rate, thus reducing a company’s interest rate and balance risk. The statistics states that the UK has around 5.7 million business population and the firms are mushrooming across the country remarkably. • Long term and short term financing are distinct from each other, mainly because of the duration for which the funds are provided, or the loan repayment term. • Short term financing refers to funding that comprises a period of less than a year to one year. Since the exposure with short term finances is lower, any firm will have secure access to financing. • Long term funding refers to financing that comprises a longer period of time that could go up to about 3-5 years or more. Long term loans are perilous and banks or lenders providing the loan have more to lose, since the amount acquired is larger, and the repayment period is longer. The determination of whether short-term financing or long-term financing is better for your business depends on your distinct market needs. As a rule of thumb, you will pay higher interest rates for short-term financing, but you can often obtain this funding more shortly. In addition, you often have much higher affability over how you use this financing than with long-term financing. To apply for unsecured loans, click here.